When I was looking through my Occasions Catalogue. I just knew I had to purchase the Fable Friends Stamp Set and add this one to my collection. The rabbit in the set is so cute and I just couldn't wait to ink him/her up. I used Shimmery White Cardstock, Stazon Ink and water coloured the rabbit with my Aqua Painter in Smoky Slate, Petal Pink and Flirty Flamingo. I wanted to do something a little bit different for an Easter Card, so I decided to use Smoky Slate Cardstock as the card base and the background. The Whisper White and Petal Pink pops out against the Smoky Slate. I just love the Whisper White Flax Ribbon it has an open weave soft look about it. 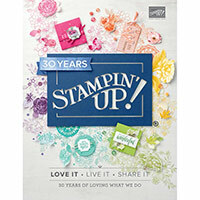 I had a look at my Stampin' Punches and Framelits Dies and I came across the following: Sprig Punch, Bitty Blooms Punch (Daisy Flower), Needle Point Elements Framelits Dies and Frosted Bouquet Framelits Dies. They all formed the layout for the rabbit to sit amongst the flowers and foliage. To finish off the card I used the White Embossing Powder for the greeting. Which it just happened to fit nicely in the Stitched Labels Framelits perfectly. I also used Dazzling Diamonds on the white cardstock but it was hard to pick up when taking a photo. White Pearls added to the daisy punch flowers and on the Smoky Slate Cardstock. I hope you've enjoyed seeing my card. Now it's time to hop over and to see everyone else's creation. I hope I've inspired you to create an Easter theme card. Vicki, this is such a stunning card... simply amazing. i love the colour combo!!! Thank you Cathy, I'm very happy on how the card turned out. I love all of the pretty flowers that Bunny is surrounded by, very lovely! I absolutely adore your gorgeous card, Vicki. The colour combo is fabulous and I love the minimalist colouring of the bunny and the layered embellishments. Thank you Judy, I love this colour combo. Vicki - I love the colors and layout of your stunning card! It is truly a work of art. Thanks for sharing. Gotta case this one! LOVE it! Thank you for visiting Barb, I'm so glad I've inspired you to recreate this card. I would love to see how you go. I really love how you've coloured the bunny plus such a great colour combo and layering for the card. Stunning. Thank you Sue, it's a favourite of mine. OMG, super cute! Your colouring is so lovely and all of the layers on your card are just perfect! I live the grey base, it looks great with the bunny. Thanks Tina, that bunny is so cute and a favourite from the set. Absolutely gorgeous card Vicki! I love the colour palette!